Sooo, where have I been? Let’s just say I had to take a mini mental vacation. I’ve had an extremely active summer so far and while it’s been enjoyable, both mentally and physically it’s been A LOT. So I pressed pause for a bit to get myself back on track. I’ve decided to stop feeling bad for taking little breaks here and there. If I need one, I’m going to take it…period. With my birthday coming up (August 11th) I’m really looking forward to a much needed weekend getaway. 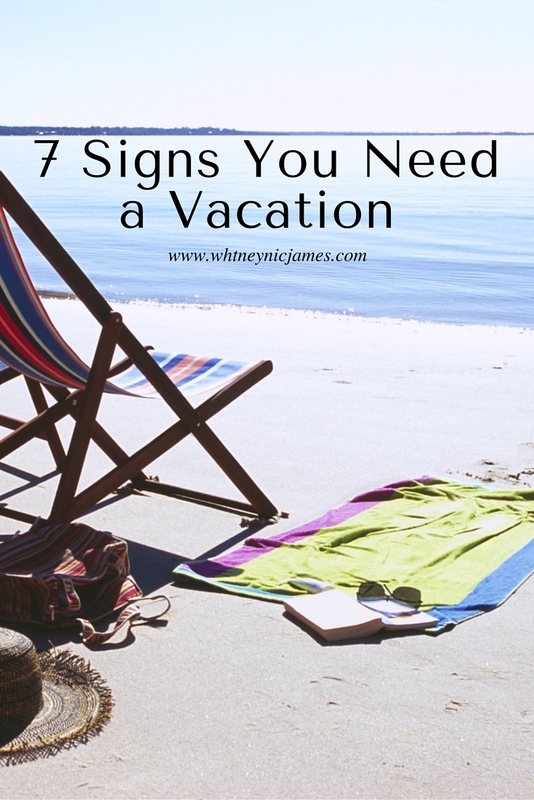 So what are some signs that you too might need a vacation? Well, read ahead to find out the 7 signs you need a vacation. 1. You’re not sleeping well at night. | If you find yourself tossing and turning throughout the night, it may be time for a vacation. Being stressed makes it harder to fall asleep, even if you’re exhausted. Not sleeping well can also lead to feeling sluggish throughout the day and let’s be honest, that’s not a good feeling. 2. Everything irritates you. | When I’m stressed, little things start to bother me. These things should really be a non-factor, but when your mind is in overdrive you tend to see everything as a big issue. You may find yourself snapping at your loved ones or even yelling at the driver next to you in traffic. These are definite signs that you need a vacation! 3. You’re forgetting important dates/appointment. | Can’t remember a doctor’s appointment? Forgot a someone special’s birthday? Your brain is on overload and you need to take a break. Period. 5. You catch yourself staring off into space…more than a few times a day. | I’ve been guilty of this, but fortunately for me, I was able to quickly snap out of it. If you’re constantly daydreaming about something other than what you should be focused on, it may be time to check out, pack a bag and head to the beach! 6. You’re not motivated to workout anymore. | I’ve definitely lost my motivation to work out at one time or another. A short vacation to refocus your priorities may be exactly what you need to get you motivated and back on track to working out! 7. You’re becoming easily distracted. | Becoming easily distracted is definitely a sign that you need to getaway. If you can’t seem to focus on the task at hand, step away from work and treat yourself to a relaxing weekend staycation. So tell me, do you think you need a vacation? Let me know! Whether it’s a quick weekend getaway, a simple day of rest, a full-blown 2-week vacation or even a staycation, we all deserve a little break every now and then. Thanks for reading and until next time, be blessed and stay safe…XO! All good signs! I’ve been there and I’m headed on a vacay very, very soon for my bday too. Yay us!! Simply Chic recently posted…WHY BLEND IN? After reading this I DEF need a vacation!